For over two years I’ve been playing with the idea of having coffee in the woods. Now by coffee I don’t mean the typical “nokipannukahvi” that we Finns love to slowly cook over an open fire, but rather a delicious energy boost for any occasion. On one of my many forest walks I had home-made fudge with me and that got me thinking. As a kid I used to buy caramel squares from the swimming hall canteen. The squares were sticky and difficult to eat but sugary sweet and delicious. As I grew older and switched school to another town I started having access to those thick, crumbly fudge squares that they sold at the local candy store. I made frequent visits to this marvelous shop that also made me feel terribly guilty, because my parents had told me I should be eating sweets only on Saturdays (the so-called “candy days” are a common thing in Finland). Well, they had told me, but not convinced me. The large, crumbly fudge pieces still remind me of those childhood candies that I used to secretly eat after school and for years I’ve occasionally spoiled myself with home-made fudge. The idea of combining coffee with fudge came to mind when I thought about the main elements of fudge: condensed milk and sugar. Coat a rectangular container of approximately 7,5 x 12,5cm’s with baking paper. Heat up the milk and stir in the instant coffee. Bring all ingredients to boil on a frying pan stirring constantly. Boil for approximately 7 minutes, until the sauce thickens. Drop a drop of fudge into cold water. If the fudge keeps its shape and doesn’t start dissolving, the sauce is thick enough and you can remove the pan from the stove. 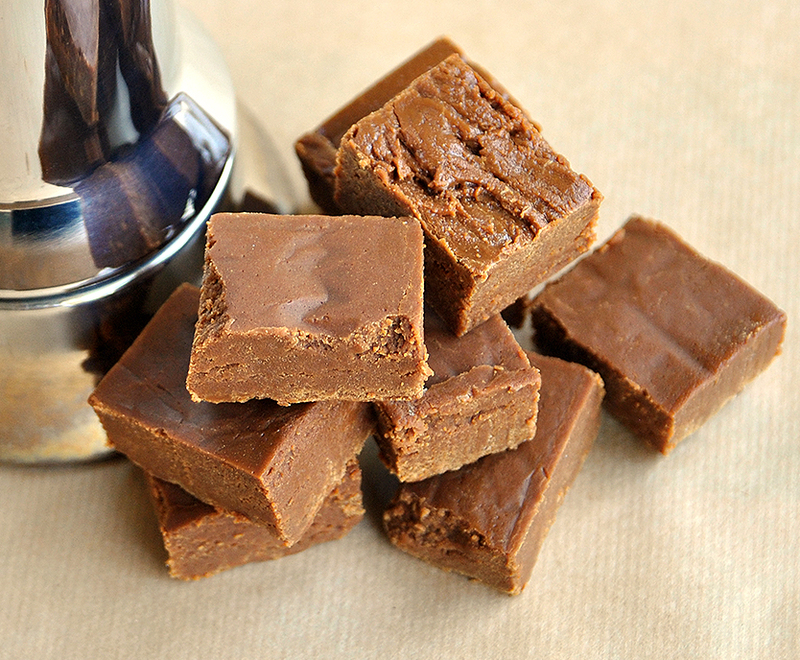 With your stirring spoon, start whisking the fudge until it starts to harden and looks more airy. Push the dough into the form and let it settle for several hours before cutting it into 2,5 x 2,5cm squares.